Image Operations (Ip Op) are image processing effects. There are a large number of them currently in Studio Artist (71 when this tip was written). While this may seem large, the actual number of different visual effects you can generate with these Ip Ops is much larger. Many Ip Op effects have adjustable algorithm parameters that can totally change what any given Ip Op effect does. By working with different Ip Op effects and adjusting their internal editable parameters you can create an extremely wide range of different visual effects useful for processing 2D images or video. All of the effects also have sophisticated compositing parameters that again can totally change what a particular effect does. For example, if a Blur effect is used with an Edge composite setting it is turned into a sharpening effect. Effect input can be specified via the IP Source parameter to be any layer, including the current layer’s alpha channel, or the current region selection. 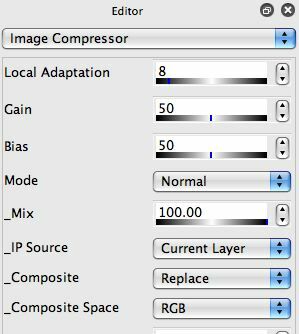 Effect output can also be routed to the layer alpha channel or current region selection (via specific Composite parameter settings). So in addition to providing an extreme number of different visual effects, Ip Ops can also be used for region selection or alpha channel special effects or cleanup. There are a large number of different prebuilt image operation presets. You can use the Preset palette when in Image Operation mode to access individual presets organized by Collection and Category. 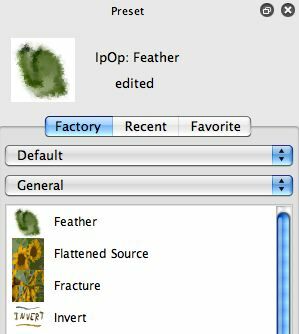 The screen snapshot below shows a few specific Ip Op presets (Feather, Flattened Source, etc) in the General category in the Default collection. Clicking on any of the individual presets displayed in the Preset palette will load them as the current active preset. Like all Studio Artist presets, they are completely adjustable and consist of individual editable parameters you can adjust in the Editor palette. The popup control at the top of the image operation Editor can be used to select a specific image operation effect. The adjustable controls available at the top of the Editor control list will change depending on which image operation effect you choose to work with. There are also a set of generic image operation controls at the bottom of the Editor control list like Mix, IP Source, Composite, etc that are available in every image operation effect. You can also use the main Operation menu to access any of the individual image operation effects. 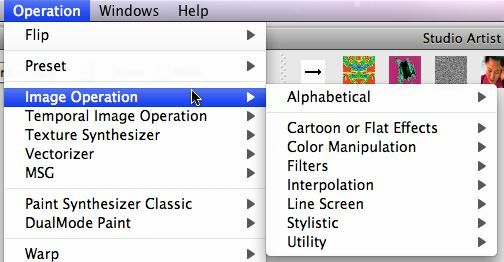 This menu lets you access image operation effects as organized by effect types, or alphabetically. Choosing a specific image operation effect using the operation menus will automatically bring up the Editor configured for the selected effect. The best way to get a feel for the vast range of image operation effects is to spend some time working through the different Ip Op effects and seeing what they do. Remember that you need to specify the source for the effect using the IP Source control. The default IP Source is the Current Layer, which means that whatever is in the current canvas layer is used as the input for the effect. If you wish to use the Source Image as the input to the effect you need to specify Source Image in the IP Source control. The ability to select any of the existing layers or region selection as an IP Source is an extremely powerful advanced feature. The Mix control lets you mix the effect output with the existing layer contents. 100% Mix means full effect output, 50% Mix means the effect output will be evenly mixed with the current layer contents. The Composite control lets you specify different compositing options for the effect. Compositing means that the current layer contents and the effect output are combined together using the specific kind of compositing specified. Studio Artist’s approach to inline compositing is very powerful and allows you to create effects in a single layer that would require multiple layers to achieve in other programs. The Studio Artist User Guide pdf gives specific information on all of the different IP Op effects, including an explanation for all of the editable parameters for each individual effect.